Yes, the Zombies. 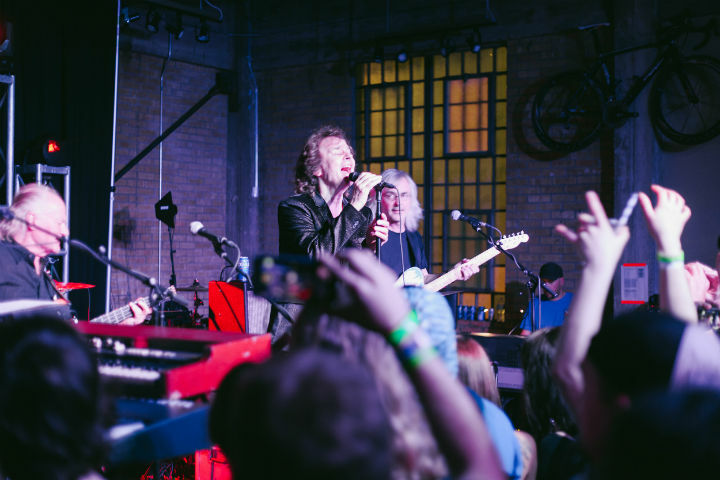 That was the answer all night as people found out that the Zombies — yes the Odessey And Oracle ones, yes the "Time of the Season" ones — played Rolling Stone's off-the-radar unofficial SXSW showcase at Mellow Johnny's. And they sounded damn good doing it. Even at 69 years old, Colin Blunstone's voice is warm and fire-dry, and he showed it right away as he shout-crooned the lyric, "And I don't know / what to say" after the chorus of set opener "I Love You." From there, the band played through a 40-or-so-minute set that explored the Zombies' history, and it was a telling reminder of their songwriting chops: "I Want You Back Again" had a jazzier feel than on record, and they jammed the latter half of it with slammed keys courtesy of songwriter Rod Argent and guitar flourishes; "Tell Her No" sounded emphatic courtesy of live, vigorous drumming. The Zombies weren't always appreciated during their career, but history has vindicated them in time that they can experience it. Argent proposed a three-song "mini-set" culled from Odessey and Oracle, the band's 1968 sleeper album that he claimed started selling "12 years" after its release date and still sells regularly today. "Care of Cell 44" sounded pristine, the quintet's harmonies tightly coiled during the chorus. "This Will Be Our Year" was slowed down slightly, so it lost its sprightly feel, but it's a hell of a song, and the familiar melody remained its strength — plus, Blunstone killed the mid-song key change so impressively, coming in before the band did, that it didn't matter. "Time of the Season," easily the band's most famous song, was done to perfection, Blunstone's breathy ahhs complementing Argent's elastic keyboard to the crowd's delight. And while Argent's solo was a bit long, the Zombies surely deserve to spread out and enjoy their success in 2015 — especially the song that allowed them to continue as a band. That they chose to gamble by ending not just with "She's Not There" but with a new song was a statement that the Zombies are still moving forward; that, and it was titled "Moving On."